A good dish for heart health and weight management with plenty of B vitamins and lycopene which may have a role in cancer prevention. A good way to get protein and fibre too. 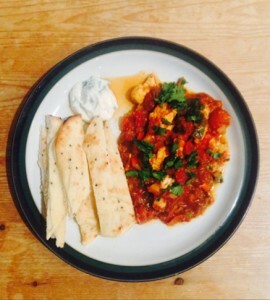 Try this tasty low fat curry as an alternative to that Friday night Take Away! If you prefer slightly less heat use half a chilli and reduce the Garam Masala a little. With the quantities below it’s pretty hot but not like a Vindaloo. The yogurt and mint that I suggest you serve it with will balance out some of the heat. Heat the oil in a deep frying pan and fry the onions and garlic gently until slightly golden. Add the ginger and chilli and cook to soften. Add to the chicken along with the onions, garlic, chilli and ginger and cook until the chicken pieces are cooked through. Roughly rip up the coriander leaves and add to the mixture, saving a handful to sprinkle on top when you serve. Serve with a spoon of fat free natural yogurt and mint and wholegrain basmati rice or pitta bread or naan. The latter will add more fat and calories.